Bringing profits into a business requires five spocks of a breakthrough product, time, efforts, money and customers. CRM is an integrated bolt that holds these spocks intact. CRM solutions tracks opportunities, optimizes sales activities and closes the deals faster.It automates routine processes,predict customer behavior better than Nostradamus and keeps business processes streamlined. To do that, it needs a strong architecture works in the back-end. 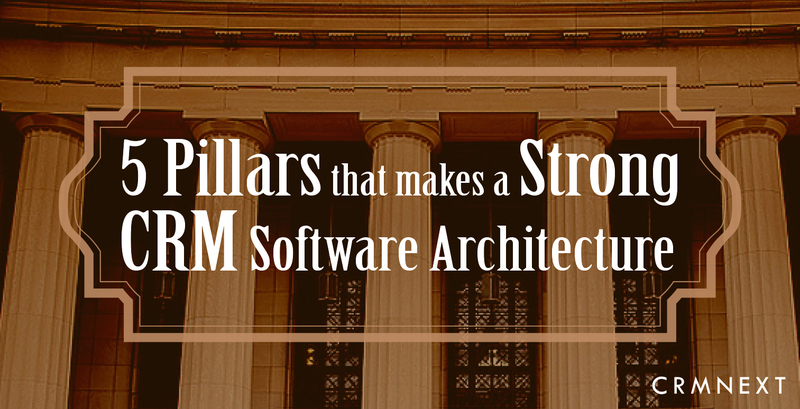 So what are the five pillars that supports a strong CRM architecture? Read on to find out. This helps the solution platform to be efficient by segregating hardware to support multiple requests and applications at the same time. It is the answer to the problems of cumbersome and expensive upgrades and lack of proper management tools. With it, a CRM system can simplify the complexities of business operations without incremental costs and additional risks. Can your CRM software handle the growth of your business? Growth is great for your business but can your resources and the CRM keep up with it? Choose a CRM that offers to scale hardware and technology without any additional investments or headache. It should lend elasticity to the system, allows for ease in upgrades, backups and prevents redundancy. The CRM solution should only require an increase in the number of user licenses to bring it up to date. And keep an eye on the growth while watching the company’s resources. It should be able to coordinate customer relations activities and pick the right tool to manage the sales process. Your CRM software should be able to access multiple databases. One of the classic symptoms ailing legacy systems is latency in fetching data from multiple sources and displaying them in a comprehensible manner. A CRM should be able to define, synchronize multiple databases and understand the management commands, and then automate. It is by processing all this information a CRM platform comes to conclusions that provide actionable insights; the insights that give you a window into the status, opportunity status, marketing efforts, client relationships, and accounts. This complete picture allows you to evaluate your business strategy. Multiple database options is also crucial to have omni-channel capability. The term metadata means "data about data". It is the descriptive information that is assigned to certain information sources and used to locate and retrieve the files and documents when required. It finds its application in record management. It helps maintain folder structures and folder hierarchies. An agile CRM software comes with incorporated metadata. Meta structure data changes the way you organize, searches and retrieve information within the system. Having this functionality helps in quicker information retrieval particularly for customer 360 degree view. It also with drag and drop integration capability for effective cross selling, sales and marketing. A CRM solution that is on commutable cloud provides a single code base irrespective of the deployment architecture. It endows the user with a scalable infrastructure that allows a business to grow without limits. An agile CRM gives the user a unified 360 view of the business based on the drill-down and multi-axis reporting and data analytics, allowing the user to build relationship and strategies based on segmentation of the data. A great CRM architecture makes it possible!